CALL US NOW IF YOU ARE HAVING ISSUES WITH YOUR MAYTAG REFRIGERATOR! We are open 24/7. There are many ways that a refrigerator can cause you headaches. It might stop keeping your food cold or it might run continuously and drive your electricity bill through the roof. It could freeze the food in the refrigeration side and cover everything in the freezer in a layer of ice. But, if your Maytag refrigerator lets you down, you don’t need to sit by and watch the quality of your food degrade and your fridge problems grow. 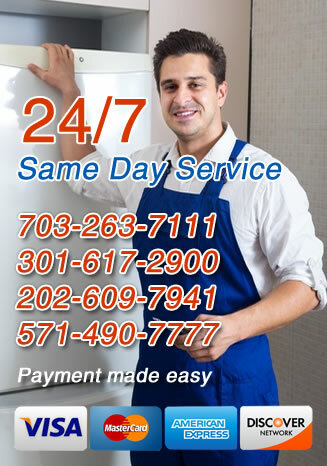 Call All Time Services for Maytag refrigerator repair service at the first sign of trouble. We’ve been repairing Maytag refrigerators in Virginia and the greater Washington D.C. area for years so we can have yours working once again before you know it. Whether you’ve just noticed a problem with your refrigerator or you’ve been ignoring minor issues for some time, call us right away so we can send someone to check it out now and get it fixed fast. Even if these seem to come and go on their own, you should call for repairs because there are clearly underlying issues. While our technicians are experts at resolving even the most difficult refrigerator problems, it’s always helpful when homeowners are very detailed in describing any and all issues they’ve noticed. When it comes time to call someone to inspect your Maytag refrigerator, call All Time Services for Maytag refrigerator repair service. 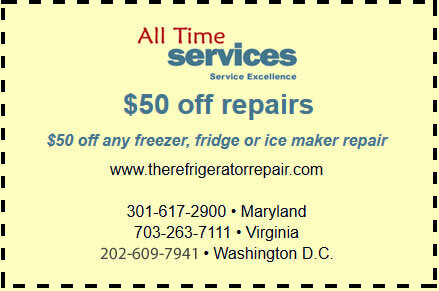 For years, we have repaired Maytag refrigerators in Arlington, Virginia, Gaithersburg, MD and the Washington DC surrounding areas and we’re happy to help you as well. Call us today to learn more about our fridge repair services and set up an appointment with one of our highly trained technicians.